Greetings, Jordanites and Jordanettes! 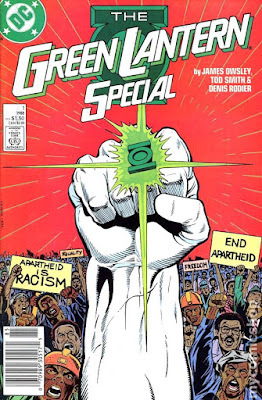 In this episode, anti-Apartheid protesters Chris (@AceComics) and Reggie (@reggiereggie) continue their look at the Green Lantern parts of Action Comics Weekly from 1988-1989, this week covering issues #615 through #623, and Green Lantern Special #1 from 1988! Providing biographical information for creators along the way, our weekly warriors go through every page of these issues, lending their arguable vocal talents and commentary. It's another oft-forgotten chunk of Green Lantern history, you don't want to miss this!